The Omnipure Q5554-C100E is a cation exchange softening cartridge which reduces hardnessand scale deposits. The cartridge easily threads into the head and the replacement is then complete. The Q5554-C100E has a flow rate of 0.5 gallons per minute. 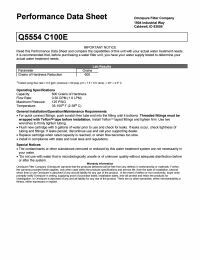 The Q5554-C100E is a FDA grade softener resin. Capacity: 600 Grains of Hardness. The Q-Series cartridges detach from a permanent head with a twist of the wrist. The cation exchange softening cartridges reduces hardness and scale deposits.